One evening in November 2006, I received an e-mail from Keith DeCandido — he was putting together a Doctor Who anthology for Big Finish Productions, a small UK-based media (books, audios, that sort of thing) publisher. Would I be interested in pitching? Here’s the pitch document. 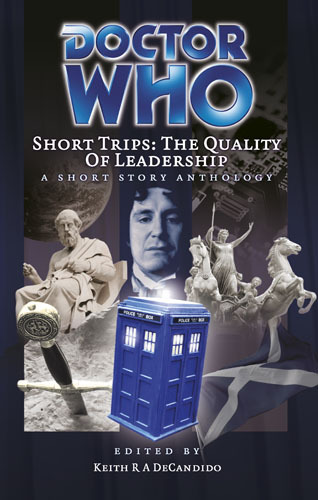 The concept of the anthology was encapsulated in the title — “The Quality of Leadership.” The time-traveling Gallifreyan was going to meet leaders throughout time and space. I pulled out a notepad, and I jotted down some ideas. The Doctor meets a religious leader in a far-future space-habitat. The Doctor gets involved in the American Revolution, where he discovers he has a personal stake. Nothing was gelling — I’d only spent an hour on these, and it was late — so I went to bed. In the early hours of the morning, somewhere around 5 o’clock, when the world was still and pitch black, my cat tried to get in my bedroom through the window. The racket woke me up, and I discovered that I had an idea for the anthology. Not just any idea. I had a mind-bogglingly awesome idea. The Doctor meets Plato, the Greek philosopher, and they go on an adventure. But not just any adventure. They go on an adventure on Plato’s terms; they go on an adventure in a geocentric universe. In contrast to the heliocentric model of Aristarchus and Copernicus which places the sun at the center of the solar system, the geocentric model places the Earth as the fixed point in the cosmos and all objects in the sky revolve around it. Wikipedia was my friend that morning. I did some quick research — did Plato write anything about the “spheres” that defined the heavens in Ptolemaic thought? I knew a little bit about pre-Copernican astronomy; Cosmos, The Sleepwalkers, and Coming of Age in the Milky Way were all friends of mine, but I couldn’t remember exactly the order that people like Plato and Claudius Ptolemy, the Alexandrian astronomer who codified the geocentric model, went. Fortunately, I discovered that Plato himself wrote a little about the geocentric model of the universe. I wrote up a one-page pitch — the Doctor meets Plato in Greece, Plato is in search of a path into the heavens, the Doctor thinks this is mad but decides to tag along anyway, and they have adventures on the road. Oh, and they fought a gorgon, too. Keith liked the pitch, and then it became a question of waiting, on Big Finish to approve the pitches, and then the BBC to approve the pitches. When writing tie-in fiction, things get signed off every step of the way. I put my time to good use; I read The Republic, Timaeus, Phaedo, Epinomis, the entire “Death of Socrates” series, some of Xenophon’s dialogues, some books on the meaning of Plato, some Greek histories, some general philosophical and astronomical texts. Every time the deadline was pushed back, I’d read more. Fortunately, Project Gutenberg had many useful texts available for free, and on days I was bored at work (a not uncommon occurrance) I’d download another text and spend Elder Health’s time on Greek philosophy. Finally, at the beginning of March 2007 the BBC gave their approvals to the pitches, and I began to write. I had a deadline of May 1st, and a word count of 10,000 to 12,000. I could do this. I very quickly hit a brick wall. The truth is, I had a voice on my shoulder, telling me how to write this story. And I ignored it. Completely. I had a nearly finished draft of the Leiber-like story, and except for the plot there’s nothing of it in the Dialogue. Yet, all the torments it caused me came as help in writing the Dialogue; I knew exactly where the story was going and what it was doing. In two days I produced fifteen thousand words, and I pared it back to twelve thousand words. I turned it in on April 30th. A lost Platonic Dialogue, that happened to star the sixth Doctor. There’s a reason why the story is a sixth Doctor story. It wouldn’t work with any other Doctor. First, only the sixth Doctor would be arrogant enough to get in Plato’s face. Second, the sixth Doctor is, at the time of the story, reeling from certain events that have rocked him to his core; he’s a broken man, basically, and he wants to lose himself. Finally, I thought that no other writer would be likely to pitch a sixth Doctor story. A few months later, I had to pare the story down to 10,000 words. My first reaction was, “Umm, how?” But once I started editing the story, it pared down fairly easily, and I liked what I came up with. “The Spindle of Necessity” is named after a place in “The Myth of Er,” a story in the last book of The Republic. It’s the place where heaven and earth meet, where souls move from the realm of the living to the realm of the dead. Plato and the Doctor each have their own reasons for traveling there; Plato, to find a way into the heavens, the Doctor because he knows it cannot exist. It’s a strange and magical story. The truth is, I had a lot of fun writing it, once the words started to flow. But I never, ever want to read Greek philosophy again!